Complimentary round trip stretch limousine hotel transfers. 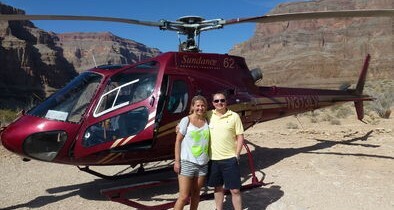 A narrated Grand Canyon helicopter tour hosted by your pilot. Breathtaking views of the Hoover Dam, Lake Mead, Grand Canyon West, and the Las Vegas Strip. 12-15 minute Colorado River pontoon boat cruise. Helicopter ride up to the rim. Shuttle to Eagle Point, Guano Point, and the Hualapai Ranch. Complimentary Hualapai BBQ lunch at Guano Point. 4 hours of leisure time at the Grand Canyon West Rim to explore on your own. Looking for the ultimate Las Vegas and Grand Canyon adventure? Hop aboard a state-of-the-art Helicopter for a breathtaking tour of the majestic Grand Canyon. With over 4 million annual visitors to the Grand Canyon, helicopter tours from Las Vegas are a very popular activity. Only from the air can you enjoy birds-eye panoramic views of the Las Vegas Strip, Hoover Dam, Lake Mead, Grand Wash Cliffs, extinct Black Volcanoes, the Colorado River and the 7th Wonder of the World, the Grand Canyon! 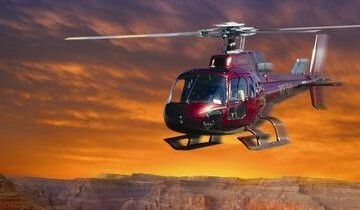 Helicopter Air Tours – Soar above and below the Rim of the Grand Canyon. Helicopter Landing Tours – Descend 4000 feet and land on the Canyon floor. Have a champagne picnic and take photos. Land on the Rim of the Canyon and experience the Grand Canyon Skywalk, a glass bridge suspended 4000 feet above the Canyon floor. No matter which option you choose, you will be inspired by the Grand Canyon’s beauty and leave with a lifetime of lasting memories. All of our helicopter tours include round trip hotel transfers from your Las Vegas hotel. Start your adventure and choose from the list of helicopter tours above!